How to apply for licences: using the PEARS online system for licence assignments, operator approvals and licence relinquishments or transfers. The Petroleum Act 1998 vests all rights to the nation’s petroleum resources in the Crown, but the government can grant licences that confer exclusive rights to ‘search and bore for and get’ petroleum. Each of these confers such rights over a limited area and for a limited period. Most licences follow a standard format but the OGA is flexible with this and will consider adapting new licences to suit special scenarios. The Secretary of State has discretion in the granting of licences, which is exercised to ensure maximum exploitation of national resource. Licences can be held by a single company or by several working together, but in legal terms there is only ever a single licensee despite the number of companies it may represent. All companies on a licence share joint and several liability for operations conducted under it. Each licence takes the form of a deed, which binds the licensee to obey the licence conditions regardless of whether or not they are using the licence at any given moment. The OGA expects companies to work their licences. In recent years, the amount of acreage left untouched, and those exclusive rights unexploited, has become a matter of concern. This led PILOT (formerly the Oil & Gas Industry Task Force) to instigate the Fallow Initiative, which incorporated a process to ensure UK Continental Shelf (UKCS) licences are optimally worked to maximise economic recovery of oil and gas. The OGA’s licensing system covers oil and gas within Great Britain, its territorial sea and on the UKCS. The designated area of the UKCS has been refined over the years by a series of designations under the Continental Shelf Act 1964 following the conclusion of boundary agreements with neighbouring states. This includes the Scottish Adjacent Waters Boundaries Order 1999 (No. 1126), which implements an agreement reached with the Faeroe Islands. Northern Ireland’s offshore waters are subject to the same licensing system as the rest of the UKCS. It receives a biennial payment from overall royalty and rental payments calculated in proportion to its population. Northern Ireland issues its own licences to cover its onshore area independently of the OGA. Each licence carries an annual charge, called a rental. Rentals are due each year on the licence anniversary (except pre-20th Round Seaward Production Licences, which were only due in their initial year). Rentals are charged at an escalating rate on each square kilometre the licence covers at that date. Usually the companies on a licence agree among themselves (eg joint operating agreements) how to apportion costs, including rentals. However, the licence simply provides that each company is jointly and severally liable to the Secretary of State for all liabilities and obligations arising thereunder, and that it is not for the OGA to determine how the rentals should be apportioned. the OGA will therefore invoice a single company (known as the licence administrator and nominated by the licence group) for a single rental payment for each licence each year. It will not collect separate rental payments within a single licence. Seaward Production Licences, and Petroleum Exploration and Development Licences, are valid for a sequence of periods, called terms. These are designed to comprise the typical life cycle of a field: exploration, appraisal, production. Each licence will expire automatically at the end of each term, unless the licensee has sufficiently progressed to warrant a chance to move into the next term. The initial term is usually an exploration period. For Seaward Production Licences this is usually set at 4 years, although it can be longer for ‘frontier’ licences. For Petroleum Exploration and Development Licences, the intial term is set at 6 years and carries a work programme of exploration activity that the OGA and the licensee will have agreed as part of the application process. This licence will expire at the end of the initial term unless the licensee has completed the work programme. At this time the licensee must also relinquish a fixed amount of acreage (usually 50%). The second term is intended for appraisal and development. It is 4 years for Seaward Production Licences and five for Petroleum Exploration and Development Licences. Both licences will expire at the end of the second term unless the Secretary of State has approved a development plan. The third term is intended for production. It is 18 years for Seaward Production Licences and 20 for Petroleum Exploration and Development Licences. The Secretary of State has the discretion to extend the term if production is continuing, but the OGA reserves the right to reconsider the provisions of the licence before doing so – especially the acreage and rentals. All the qualifying criteria for continuation into a following term of the licensee define the minimum amount of progress that the licensee must make. There is no suggestion that they set maximum amounts of progress that the licensee is allowed to make, or that they limit the exercise of the licensee’s rights. Licensees are entitled to ‘determine’ (i.e. surrender) a licence, or part of the acreage covered by it, at any time (unless the licence is still in its initial term and the work programme is incomplete). The OGA positively encourages the surrender of acreage if the licensee does not intend to work it, and a minimum relinquishment of acreage at the end of the initial term is a condition of most licences. Partial surrenders are subject to restrictions, depending on the complexity of the area relinquished. The OGA does not wish to create unlicensed areas so irregular in shape to be unattractive to other companies. Many licences cover more than one block. ‘Multiblock licences’ are offshore licences for which the blocks have widely divergent licence groups of companies. This is common for blocks that are scattered geographically. while the case for splitting more complicated multiblock licences is greater, it will be more difficult for the partners to reconcile the commercial arrangements. in past discussions industry raised concerns about the robustness of the splitting process. As far as the OGA is aware, these are yet to be resolved. planning permission from relevant local authorities. In particular, nothing in part I of the Act confers, or enables the Secretary of State to confer, any right to enter on or interfere with land (see section 9(2) of the Act). However, it should also be noted that section 7(1) of the Act applies the Mines (Working Facilities and Support) Act 1966 in England, Wales and Scotland for the purpose of enabling a licensee to acquire such ancillary rights as may be required for the exercise of the rights granted by the licence. Consult the relevant map to see whether any particular site is covered by a licence (eg during house conveyancing). For further information email approvals@decc.gsi.gov.uk and include the ordnance survey coordinates of the site in question (The OGA can not identify sites using postal addresses or postcodes). The Supreme Court made a judgement dated 28 July 2010 in the case of Star Energy Weald Basin Limited and another (Respondents) v Bocardo SA (Appellant), which concerned issues of trespass and damages. The PEARS screens are designed to act as a wizard, guiding the user through the process of applying for the Secretary of State’s consent to various types of transaction. Below is a guidance document that sets out step-by-step instructions to the use of PEARS, and Info symbols throughout the PEARS screens carry context-sensitive tips about particular screen items and explanations of error messages. There are also examples of the Consent / Rejection Letters that are issued from the PEARS system. licence administrator changes (where a user nominates the licence group’s point of contact for the OGA). surrenders of acreage (the voluntary relinquishment of part of a licensed area by the licensee while the licence continues over the remainder). PEARS will help users compile their applications, and will check their input for obvious errors such as interest allocations that don’t add up to 100%, but for the most part leaves users free to assemble their applications as they see fit. If the OGA approves a transaction, PEARS will mail the approval to the applicant and anyone else he has asked for it to be sent to. After execution of an approved transaction, users will be expected to submit a scanned copy of the implementing agreement; and PEARS will make this process easy. PEARS delivers a necessary level of security by restricting access to registered users with password access, but it is the licensees themselves who control the confidentiality of their own data by giving specific account-holders access to their casework and data. For example, a licensee might decide to allow only its own lawyers to access one of its cases, or to allocate one or more access roles to account-holders at a law firm – the choice rests with the applicant. Access is granted by allocating particular ‘roles’ (eg editors, viewers and submitters). Authority is based ultimately on a signed nomination by an authorised signatory of an Access Manager, but thereafter certain registered users have the authority to nominate further users on a case-by-case basis, creating a case and the team to handle it. We expect most account-holders to be given access to one specific case at a time, but this is not a decision that either the OGA or PEARS will impose on licensees. The first step for a licensee is to choose somebody to act as its Access Manager, who can then allocate certain other top-level roles to particular users. To do so, the licensee needs to complete, sign and return the contact details form below. As well as processing licence administration casework, PEARS can handle rectifications and restatements, and provides a simple and straightforward way for licensees to tell the OGA about errors in records, and to upload supporting documentation. As part of a general drive towards improvement of the quality of records, each application will be checked for consistency between its starting point and the records of the licence’s current position. The first time each licence is implicated in a PEARS application, the user will have to confirm this consistency, or tell the OGA about any discrepancies and upload supporting documentation so that we can consider, and if appropriate implement, a correction. We have made this process as simple as possible, but we do nevertheless strongly recommend licensees to check records well in advance of their next application so that any discrepancies can be sorted out in good time. All these procedures are covered in the main guidance document. Part I of the Petroleum Act 1998 (and before it, the 1934 Act) vests all rights to petroleum in the Crown, including the rights to search for, bore for and get it. It also empowers the Secretary of State to grant licences to search for and bore for and get petroleum to such persons as they see fit. Part III of the Act deals with submarine pipelines and Part IV with the abandonment of offshore installations. As with any licensing system, many of the detailed regulatory provisions are laid down in conditions attached to the licences. The Petroleum Act is rather unusual in that it requires these conditions (model clauses) to be published first in secondary legislation. Up to the 19th Round, the model clauses were incorporated into licences by means of a single short paragraph, but from the 20th round onwards they have been set out in full in the licence itself, for the sake of clarity. It is the licensee’s responsibility to understand these conditions and ensure they are observed. Model clauses attached to existing licences are not affected by the issue of subsequent sets of model clauses, except through specifically retrospective measures. There are other restrictions on activity besides those contained in the model clauses. All new Seaward Licences (Production and Exploration) contain additional restrictions, eg a requirement to appoint a Fisheries Liaison Officer – and there are other controls (see below) that have nothing to do with the Petroleum Act. As it is impossible to summarise every control a company might be subject to, it remains the responsibility of every licensee to be aware of all regulatory controls and to comply with them. In 1994 the EU laid down strict rules member states must follow when issuing petroleum licences that comprise the factors that may (and may not) be taken into account when deciding whether or not to issue a licence, and the minimum amount of public consultation required. These rules are contained in the Hydrocarbons Licensing Directive, which was implemented in the UK in 1995 by means of the Hydrocarbons Licensing Directive Regulations. The terms are of different durations, in accordance with the licence type, and there is an escalating annual rental. While each term is commonly associated with a particular phase of a field’s life cycle, the licence gives the same rights from beginning to end; so nothing in the licence can bar production during the initial term, for example, if the licensee were to move that fast. All Seaward Production Licences have the prefix ‘P’ (eg P001) whereas Landward Production Licences have a range of prefixes. This is the familiar Seaward Production Licence that has been in use since offshore licensing began. Most licences issued since seaward licensing began have been Traditional Licences. An applicant must prove technical/environmental competence and financial capacity before an offer of a Traditional Licence will be made. This is a variant of the Seaward Production Licence designed to allow small- and start-up companies a Production Licence first and to attract the necessary operating and financial capacity later. The difference is seen more in the application process than the licence itself, except in that the annual rental rate on a Promote Licence is reduced by 90% for 2 years. The licence requires financial, technical and environmental capacity to be in place, and a firm drilling (or agreed equivalent equally substantive activity) commitment to have been made by the end of the second year – or the licence will expire at that time. Applicants do not need to prove technical/environmental competence or financial capacity before award of the licence but they must do so within 2 years of its start date if they are to keep the licence. They will otherwise not be permitted to operate until they have done so. This is another variant of Seaward Production Licence. It has a 6-year exploration phase and is designed to allow companies to evaluate large areas with greater materiality for a period, so they can look for a wider range of prospects. An applicant must prove technical/environmental competence and financial capacity before offer of a 6-year frontier licence is made. This is the most recent variant of Seaward Production Licence. It is designed for the particularly harsh West of Scotland environment, and is similar to the existing Frontier Licence but with an initial term of nine years. The OGA will only consider work programmes of the Drill-or-Drop type with the decision to be made by the end of the sixth year and (if the licensee chooses to drill) drilling to be completed within the remaining 3 years of the initial term. Because geophysical data is especially sparse in this region, the OGA expects work programmes to include significant new seismic acquisition. Applicants must prove technical/environmental competence and financial capacity before a licence offer will be made. This is the full name of the Landward Production Licence. It is similar to the Traditional Seaward Production Licence, although for historical and practical reasons there are many differences in detail. Applicants must prove technical competence, awareness of environmental issues and financial capacity before offer of a PEDL will be made. A company that wants to explore and does not need exclusive rights to drill or produce can apply for a Seaward Exploration Licence or a Landward Exploration Licence. Exploration Licences are useful for seismic contractors who wish to gather data to sell rather than to exploit geological resources themselves, and to the holders of Production Licences who wish to do exploration outside the areas where they hold (or require) exclusive rights. There are two types of Exploration Licence: one for the Seaward areas and one for the Landward areas. Each one grants rights to explore only, not to produce; and is non-exclusive, covering all acreage outside those areas covered by any of the corresponding Production Licences that are in force at the time. The annual payments on Exploration Licences are lower than those on the corresponding Production Licences. If the holder of an Exploration Licence wants to explore acreage covered by a Production Licence, it will need to gain permission from the holder of that Production Licence. Both types of Exploration Licence cost a flat rate rental of £2,000 per year. The Seaward Exploration Licence covers non-intrusive exploration whether carried out for the sake of hydrocarbon production, gas storage, Carbon Capture and Sequestration, or any combination of them; the Landward Exploration Licence covers exploration for petroleum only. Contact Claire Grant on 01224 254052 or email claire.grant@oga.gsi.gov.uk for further details. Where the operator/owner of a coalmine has to capture natural gas in order to make the mine safe, he requires a licence from the OGA pursuant to the Petroleum Act 1998. Such a licence is called a Methane Drainage Licence (MDL). OGA accords a high priority to issues of safety and will consult the Coal Authority about each case; principally to seek its advice about the safety issues that a particular case raises and to ensure that the operations are consistent with the Coal Authority’s own regulation of the mine. Flaring or venting of the gas would require OGA’s consent under section 12 of the Energy Act 1976, as amended by the Gas Act 1986 and Gas Act 1995. However, there are several exemptions to this requirement, including one that provides that flaring is permitted under the provisions of a production licence, if such a licence is in place. Application for an MDL should be made in writing to the Head of Licensing and Consents at OGA with a payment of £50 (see The Petroleum Licensing (Applications) Regulations 2015). See the Coal Authority’s website for further information about the Coal Authority’s licensing role. Underground Coal Gasification (UCG) is regulated by the Coal Authority. It does not require a Petroleum Act licence from OGA. That is because such methane as might be generated by the UCG process does not qualify as ‘petroleum’ for the purposes of the Petroleum Act 1998 (because it did not exist as methane in the strata), and section 9(1) of the Petroleum Act 1998 exempts any native petroleum that is being set free from the coalseam by the UCG process (because it is being “set free” from the coal “in the course of mining”). Petroleum Exploration and Development Licences (PEDLs) were introduced at the Eighth Licensing Round (in 1996) to reduce the bureaucratic burden of issuing a series of licences. the OGA no longer issues any licences of these types but a number of them, and older licences, are still in force. The Department of Energy issued EXLs from the First Onshore Licensing Round (1986) until the Sixth (1992). Each Exploration Licence (EXL) ran for 6 years and carried an agreed Work Programme (just like the 6-year Initial Term of a modern PEDL). The 5-year Appraisal Licence gave the licensee time to prepare a development programme and gain long-term planning permission. Only if both of those were in place would the department consider issuing a 20-year Development Licence. EXLs that have not expired or been relinquished have been converted to the same terms as a the PEDL but their names have not changed, eg EXL141 or EXL169. The OGA issues licences through competitive licensing rounds. It believes this method yields better quality bids than other methods. Unlike auctions, for instance, licensing rounds do not divert significant sums of money away from exploration work and they give a much better expectation that a licence will be awarded to the bid that promises to optimise exploitation of the UK’s petroleum resources. The OGA is committed to a competitive licensing system in which licences are issued in regular Licensing Rounds, and consultation has also revealed the industry’s preference for this system because of its predictability. There may, however, be exceptional circumstances where it would be reasonable for a company not to have to wait for the next Licensing Round to get a licence, so the OGA also has an “Out-of-Round Application” process. It can only be used if justified by exceptional circumstances, and should not be seen as a routine alternative to the Licensing Rounds system. The OGA can only accept licence applications in response to a formal Invitation to Apply, so any company seeking an out-of-round licence must first convince the OGA of the case for an Out-of-Round invitation. If the OGA agrees to issue an Out-of-Round Invitation, in most cases the process will comply with the Hydrocarbons Licensing Directive, as implemented by the Hydrocarbons Licensing Directive Regulations (which will entail publication of the Invitation in the European Journal with applications usually being taken at least 90 days later), and all other relevant provisions including the Strategic Environmental Assessment Directive. A case for an Out-of-Round process will generally have to show that waiting for the next Licensing Round would cause unnecessary delay to activities under an existing licence (and that going Out-of-Round would avoid that delay) or that broad competition is not feasible even in a Licensing Round. the OGA has, for example, accepted a case to go Out-of-Round where an existing licensee demonstrated that his development plans required a new licence over adjoining acreage, and that even in a Licensing Round nobody else could reasonably have competed with him for it. Out-of-Round awards are not appropriate for pure exploration or where a company simply prefers not to wait for the next Round. Companies who want the OGA to launch an Out-of-Round process should approach Jen Brzozowska at jen.brzozowska@oga.gsi.gov.uk in the first instance. If the OGA invites applications, applications should be made in the same way as during a Licensing Round and the same guidance will apply. You can apply at any time for a new Seaward Exploration Licence (or for an extension to an existing Seaward Exploration Licence) using the Exploration Licence application form below. Seismic surveys are subject to a consent procedure, which may require an environmental impact assessment. Email the Environmental Management Team at emt@decc.gsi.gov.uk for more information. The operator of an onshore production licence (PEDL, EXL, AL, DL, etc) can apply for the adjoining Supplementary Seismic Survey Licence at any time, using the application form below. The completed form must be accompanied by an A4 map of the area to be licensed. Contact Ricki Kiff on 0300 068 6042 or at ricki.kiff@oga.gsi.gov.uk for more information. A company that is party to a licence may wish to sell its interest, or a part of it, to another company. Any transaction in which one or more companies enters a licence, and/or one or more companies withdraws from it, is referred to in this guidance as a licence assignment. Licence assignments are prohibited unless they have the prior consent of the Secretary of State. The OGA will consider any assignment made without prior consent as a very serious breach of the model clauses attached to every licence licence, and as grounds for immediate revocation of the licence or to reverse the assignment using powers granted in the Energy Act 2008 (s76). This section applies equally to assignments between unaffiliated companies, to assignments between sister companies within a single company group, and to the withdrawal of a company from a licence. At the time of writing (December 2012), the Portal only handles assignments of offshore licences; those of landward licences continue to be handled by email; see below. We are working to integrate them into the Portal during 2013. The OGA will routinely seek advice about applications from the Licensing and Consents Unit’s asset teams, Exploration Team, Decommissioning Unit, the OGA financial advisers and others. We also circulate details of each application to HM Revenue & Customs (HMRC). If there are no reasons to withhold it, the OGA will transmit the Secretary of State’s approval of an assignment, and it then rests with the applicant to execute it. The OGA requires notification of execution when it has happened so that we can update our records, and will not consider an assignment to be effective until we have received it. The OGA generally considers increased volumes of licence assignments as a positive indication of companies improving their alignment on each licence. This does not mean they are regarded as mere tradable assets, and we expect companies to buy licence interests with a view to exploiting them – not merely to sell them on. technical and financial capacity of the licensee – The OGA must be satisfied the proposed new company is suitable for the licence, and that it has the capacity to participate fully in licence operations and discharge its licence obligations. See Criteria to become a licensee for more information. decommissioning costs – financial capacity will be a greater concern if significant decommissioning costs are likely to be incurred by licensees. The dedicated decommissioning unit in Aberdeen is looking to ensure future decommissioning liabilities are covered. licence alignment – this is not usually a concern for the OGA but we might need to look carefully at a case in which one company gains a completely dominant position on a licence, or where one company has such a small interest that it is not motivated to participate in exploiting the licence but yet can still block work. Intragroup assignments – The OGA has no objection in principle to assignments to a sister company but if they are made specifically to dispose of the licence interests via a corporate sale, the OGA will generally want to know who the buyer is before it is approved. Where the reason for the assignment is tax-related, we recommend applicants should first discuss it with HMRC (but the OGA will anyway routinely inform HMRC of new assignment cases as we receive them). fragmentation of licence interests – in some circumstances the creation of very small licence interests may be of questionable advantage to the UKCS. It may, for instance, prejudice the licence group’s attempts to agree on new work by introducing new voices. However, such drawbacks may be outweighed by a new licensee’s expertise or experience. As a general rule, the OGA suggests any licensee seeking to create small licence interests (under 5%) should justify the transaction in the ‘extra information’ section of the application form..
infrastructure – this is a conceivable rather than routine issue, but the OGA might be concerned if, for instance, it seemed an infrastructure owner was seeking to enter a licence group to influence tariffing negotiations. OPOL – The OGA expects all offshore operators to be members of the Offshore Pollution Liability Association and to register each of its separate operatorships. The current holder of the licence must gain permission to transfer it and therefore must lodge the application to the OGA, even though in many cases much of the information the OGA needs will have to come from the acquiring company. Consent will not be granted unless the OGA has all of the required information. The Secretary of State’s assignment consents and operator approvals are valid for three months after the execution/handover dates specified in the application form. Completions delayed beyond three months will require a renewal, which we will generally consider on receipt of a revised completion date and confirmation that the details in the original application are still valid. The form must be fully completed and in accordance with the guidance note. Avoid excessive precision when specifying the size of a licence interest; the OGA generally does not record such figures beyond two decimal places. Once consent has been granted, the assignee must notify the OGA within 2 weeks of execution of the assignment. A confirmation slip to return is included with every consent email. Please do not address applications to individuals. If the application for transfer is approved, the Secretary of State’s consent will be sent to the applicant and copied to the assignee. We will simultaneously approve the amendment/novation of all related agreements except operating agreements, which are dealt with separately (see Open Approval Operating Agreements for details). The OGA prefers to email its replies and will copy to other parties as requested if email addresses are provided. A hard copy can also be posted as requested (with the postal address) at box S17 of the application form. Consent for the transfer is conditional on the Deed of Assignment substantially conforming to a draft approved by the Secretary of State. There are currently two such approved drafts. The first is contained in the PILOT Master Deed, which sets out agreed assignment procedures and forms agreed by PILOT (being a PILOT procedure this is only available to offshore licensees) LOGIC offers guidance on using the PILOT Master Deed. If you choose to use this method, you can only depart from it in ways that do not materially alter its effect (for instance, you can move the company names to a Schedule). It does not include execution or attestation clauses, which should be added as required. You can disapply the Contracts (Rights of Third Parties) Act 1999 in relation to the deed, and/or provide for the execution of the deed in counterpart. You must also decide whether jurisdiction should lie with the English, Scottish or Northern Irish courts (refer to the Civil Jurisdiction (Offshore Activities) Order 1987 (1987/2197). Use of either of the approved drafts is not compulsory, but if you want to use a different draft you must submit a copy in advance because it will need to be considered by the OGA lawyers, and that will considerably increase its processing time. Licensees sometimes ask the OGA to confirm it has “no objection in principle” to a proposed transfer – particularly for an Earn-In agreement, in which the assignee’s expenditure necessarily comes before the assignment. The OGA may be able to issue an assurance if it receives enough of the information that would be necessary actually to consider the assignment, but the OGA won’t be able to offer any binding undertaking or replace the formal consent procedure which will still be required in due course. This depends on such factors as complexity of the assignment, quality of information initially provided, number of other applications being processed, etc. We aim to process 95% of standard cases in 10 working days (although this cannot be guaranteed). Production operatorship and financial checks in particular can take longer than this; the overall processing time will increase to 25-30 days where such consideration is involved. If a proposed assignment would affect either the holder of a Pipeline Works Authorisation (PWA) or the operator, user or owner of any offshore pipeline, the holder of the PWA must seek a variation to the relevant Pipeline Works Authorisation (PWA). The OGA strongly advises the variation be sought as soon as possible and at least 28 days before the proposed completion of the assignment, so as not to delay it. Phone 01224 254056 for further information. The Model Clauses do not impose any requirement for the Secretary of State’s approval of a change of control of a Licensee (e.g. at a corporate takeover), but they do specify it as grounds for revocation (if the Secretary of State has instructed the Licensee to make a further change of control and the Licensee has failed to do so in a certain time). The existence of this power can result in a request for comfort that the Secretary of State will not exercise it. The OGA is generally willing to consider such requests, but we will not be able to offer any cast-iron promises; any comfort we give will be based on the information available to us at the time, and limited accordingly. The OGA’s policy requirement in this regard is that the licensee can demonstrate that the Change of Control will not prejudice its ability to meet its licence commitments, liabilities and obligations. a list from the new corporate parent of its prospective subsidiary’s UKCS licence holdings and commitments (especially those arising from Work Programmes, from the Fallow Initiative or the Stewardship Process) and a statement that it will support the licensee in meeting these commitments. Upon review of the initial information, the OGA may seek further information including, but not limited to, evidence of adequate ongoing funding arrangements and assurances from the new corporate parent of continuing financial support for its subsidiary. Where the OGA requires further information to enable it assess the licensee’s post-acquisition financial position, it will send a formal request to the originator of the change of control notification asking for such information as it needs to. Where a licensee is dependent upon the financial support of its current corporate parent to enable it to meet its licence obligations and will become reliant upon the financial support of its new corporate parent, the OGA will require a parent company guarantee from the new corporate parent to replace any existing parent company guarantee which may have been issued. The OGA’s forms of words for parent company guarantees may be found here. The OGA would also require a parent company guarantee from the new corporate parent if, prior to the acquisition, sufficient value had been transferred out of the licensee to render it unable to meet its licence obligations without the financial support of its new corporate parent. Failure by the new corporate parent to provide a parent company guarantee in one of the 2 prescribed formats may constitute sufficient grounds for the Secretary of State to invoke his powers under the Model Clauses to either order a further change of control or to revoke any UK petroleum licences held by the licensee. Production Licences can be extended beyond their original expiry dates if necessary to allow approved fields to finish their production. The OGA will not extend a licence until it is clearly necessary, so licensees expecting to need an extension should make their formal approach to the OGA between six and twelve months before their licence’s expiry date. The OGA may request an update to the Field Development Plan to support a request for a licence extension. The OGA may refuse to extend a licence if the licensee’s performance is unsatisfactory, in terms of competence, capacity or stewardship. Licence expiry date is not a factor in the OGA’s consideration of a new FDP or FDP addendum. If the OGA has approved an FDP, or if the OGA confirms that the FDP is technically and financially approvable (even though the environmental process may not have concluded), the OGA will offer the licensee a short extension to allow the new field to reach production. This extension will set a reasonable deadline for first production, based on the plans set out in the FDP, and the OGA may also add intermediate deadlines for specific waypoints on the way to production. The OGA may terminate the licence if any of these deadlines are missed. Once first production has been reached, though, the field will be treated the same way as any other field on an extended licence. Licensees are welcome to raise individual cases of this sort with Jen Brzozowska (tel: 0300 068 6030); and any such case is likely to be raised by Jen anyway during the Fallow and General Licence Reviews. The OGA works to maximise licensee exploitation of the nation’s petroleum resources. We believe we can best achieve this with a mix of companies – from multinational super-giants to small niche players. As production licences confer exclusive rights, we must be satisfied no licensee will block exploitation through a lack of technical or financial capacity. In addition, the Government has essential requirements, such as the establishment of a tax base. Anyone who wants to be a licensee must meet certain criteria, whether they are applying for a new licence or seeking to become a licensee by assignment. There are criteria concerning finance, residence and organisational structure. The OGA routinely copies new assignment cases to HM Revenue & Customs (HMRC) for information. The vast majority of transactions take a form that is familiar to both the OGA and HMRC, and are not expected to raise any new tax issues; so tax is not generally a factor in the OGA’s decisions. However, the OGA does discuss tax issues with HMRC and may take them into account in any particular decision. HMRC is aware of certain commercial arrangements that would present an inherent tax risk. These include having a partnership on a licence and the assignment of a beneficial interest in a licence to somebody other than the licensee. The OGA will exercise a presumption against approving any such arrangements, though any case would be considered on its merits and the OGA is prepared to discuss proposals to address the tax issues. Having a UK branch of a foreign company registered at Companies House. A ‘fixed place of business’ normally means a staffed presence; refer to section 148 of the Finance Act 2003 or article 5 of the OECD Guidelines for Multinational Enterprises for more information. Whenever there is more than one party to a Production Licence, the Model Clauses impose joint-and-several liability on them all. Nevertheless, for day-to-day purposes those parties will commonly enter into an agreement that apportions costs and revenues among themselves (for example, two companies agreeing a 50/50 split, often called an equity split). Such apportionment requires the Secretary of State’s consent under the model clauses. It is defined quite broadly (see, for example, Model Clause 41(5) in Sch 10 of the Petroleum (Current Model Clauses) Order 1999). Joint Operating Agreements (JOAs) are not controlled in their own right. The creation, amendment or novation of a JOA may entail something that requires the Secretary of State’s consent – for example, it may (re)apportion licence rights or appoint an operator. If so, consent should be sought for the thing that requires it in whatever way is appropriate – via the Portal for a seaward apportionment of rights or an operator appointment, for example. If a JOA does nothing that needs consent, it needs no consent in its own right. Operating agreements created as a result of the unitisation of a field across several different licences are usually called Unit Operating Agreements, but for the purposes of this page the same principles apply. Until the OGA has migrated all its landward licences (PEDLs, EXLs, PLs, etc) into the UK Oil Portal, some apportionments of rights granted by landward licences continue to be covered by the [Open Permission (Operating Agreements). It grants prior approval to most instances of apportionments made under landward licences. In this context, an Open Permission is a type of approval that the Secretary of State issues once, to cover a whole class of regulated acts. It is not issued to any particular person or company and so is open to be used by anyone at any time, provided that its terms are complied with. If a company is satisfied that the Open Permission encompasses the transaction that it wants to carry out, and provided it complies with any conditions or restrictions on its use, the company can make its transaction without further individual permission from the OGA. A company cannot receive a copy of the Open Permission in its own name, and because it has already been issued nobody can apply for one. It is the responsibility of the person proposing to use an Open Permission to be sure that it covers the transaction contemplated, and to ensure the satisfaction and compliance with the permission’s provisions. The OGA will not provide legal advice. Note that one of the conditions of use is that certain information must be sent to the OGA within 2 weeks of its use. This can be made by email to approvals@oga.gsi.gov.uk. Where an act is already permitted under the terms of an Open Permission, the Secretary of State will not further approve it with an additional individual approval. However, where an act is excluded from the Open Permission by its conditions or restrictions, the Secretary of State can grant individual approval in response to an individual application, but generally any company seeking it should expect to have to make a special case for exceptional treatment. The Open Permission only covers the apportionment of licence-granted rights relating to petroleum won and saved, and any proceeds of its sale. Any particular agreement may be subject to other regulatory provisions (including other controls imposed by the model clauses). In these cases it remains the responsibility of the licensee to comply with the provisions. In particular, nothing in this approval affects controls on licence assignments, operator approvals or the Petroleum Act’s decommissioning provisions. It is common practice for banks lending money to companies to demand a charge on the company’s assets as a form of collateral. 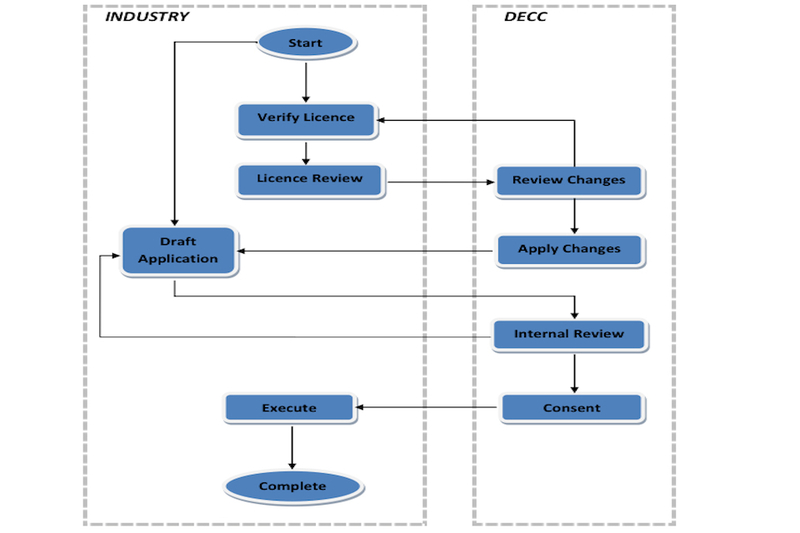 Creation of a charge on a Petroleum Act licence is controlled in accordance with the model clauses attached to each licence. Where the Open Permission has already granted consent to the creation of the charge, the licensee can do so without seeking further individual approval from the OGA. Notification should be emailed to approvals@oga.gsi.gov.uk or to the OGA’s postal address. There is no form to complete or a prescribed format for the notification. If a borrower defaults on the loan, the lender may wish to seek enforcement of the charge to have a licence interest transferred to itself (possibly after appointing a receiver). This would constitute a licence assignment, which is controlled in its own right under the model clauses. Faced with a request for consent to such an assignment, the OGA would take into account all relevant factors, including the expectations of the lender. However, the Secretary of State must exercise their discretion in each specific case, and this cannot be fettered by earlier promises to take, or not to take, a particular course of action. The OGA will also not make such promises. The OGA is aware of forms of security where the assignment of the licence to a chargee occurs at the moment the security is created (rather than later, if and when the charge should be enforced). These forms appear to be particularly relevant where a charge is to be made under Scottish law. Before creating such a charge the licensee would require the Secretary of State’s consent to the immediate assignment of his licence to the chargee, but it is difficult to envisage circumstances in which the Secretary of State could make an informed decision at that time. The Open Permission (Creation of Security Rights over Licences) was therefore reissued on 6 February 2012 to exclude from its scope the creation of security on such terms. However, such security is very unusual among licensees so this change is not expected to have any material impact on them. This guidance reflects current policy on such security, but the OGA is prepared to discuss other ways to address concerns, either on a basis of case-by-case approval or by further changes to the Open Permission. The Master Deed was developed by the United Kingdom Offshore Operator Association (UKOOA) Progressing Partnership Working Group, DECC, and other interested organisations. It aims to expedite the transfer of offshore licence interests and other agreements relating to associated assets and infrastructure, and it introduced a standard pre-emption regime to give confidence to incoming companies. Under former practice a deal was often delayed by the requirement of signatures on many different documents – even when all parties were content with arrangements. The Master Deed allows licensees to appoint an administrator to act as their attorney for the execution of proforma documents. The administrator is a specially created subsidiary of UKOOA, titled UKCS Administrator Limited. The paid-for service is provided by LOGIC on behalf of the administrator, under a separate services agreement. Use of the transfer arrangements is voluntary for the party disposing its interest. The arrangements do not affect existing rights of objection to an assignment or provisions for the granting or withholding of consents. When informed of a proposed licence assignment, companies on a licence have an initial seven-day period in which to waive or reserve their rights to pre-emption. If they reserve their rights, they have 30 days to decide whether or not they want to pre-empt. Following earlier concerns from new entrants about the risk of pre-emption on new deals, these arrangements were introduced to clarify and assure buyers – particularly those that have entered into extensive and/or expensive negotiations. Further information is available on the LOGIC website using the current contact details shown there. 4 December 2012 First published.